Last Revised: 14 June 2005, 19:12 GMT. In 1950, Mexico was about to compete its section of the great Pan-American highway. To celebrate that event, it was decided to create a motor race on the 3,500 km distance of the highway from the border of Guatemala and the United States. 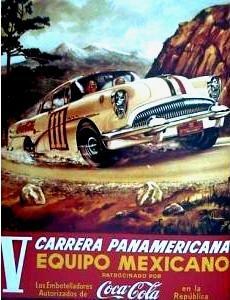 From 1950 through 1954, "Le Carrera Panamericana Rally Mexico" was held five times. And five times the worlds greatest drivers traversed the vast expanse over terrain that varied from deserts, prairies, mountains and tropical jungles. A legend was born. 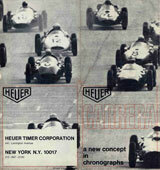 Introduced in 1963, Carrera was the first Heuer line of watches with it's own brand name. 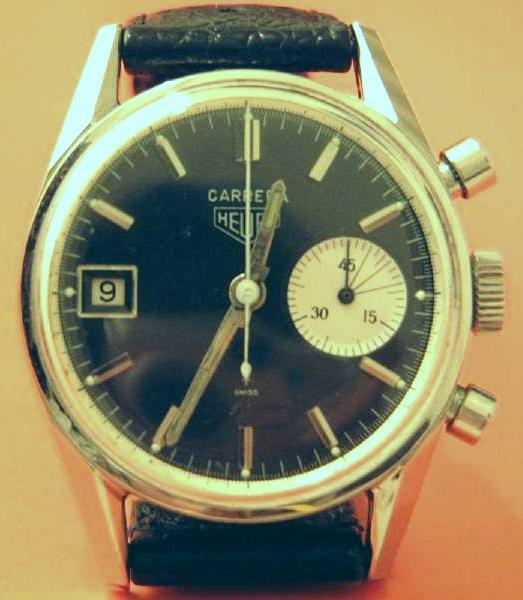 Although the Carrera was a evolution in terms of design for Heuer, its look was completely distinctive when compared to the commonly seen and sold chronographs of the 1940's and 1950's. Jack Heuer (pictured at left), the CEO of the company, wanted a watch with an excellent readability. So he printed the 1/5 sec scale on the "rehaut" (the inner bezel) of the watch. 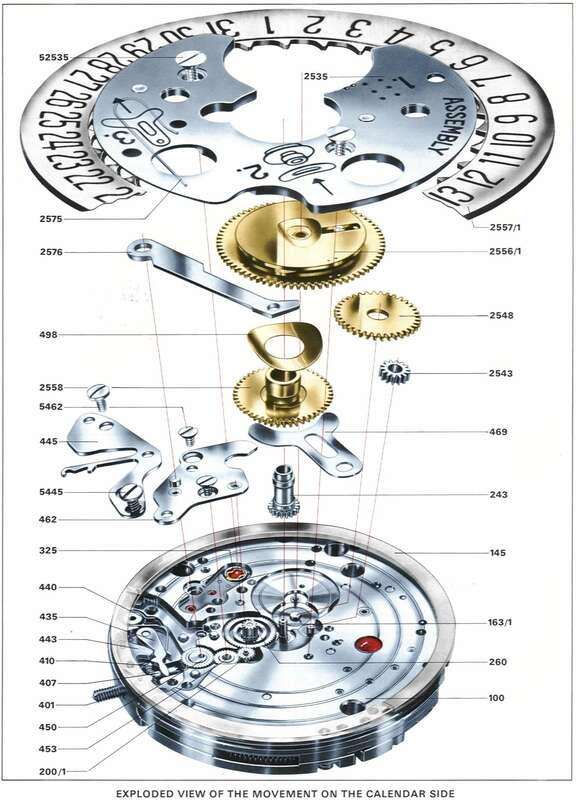 Tachymeter or pulsometer scales were not placed in the centre of the dial (a typical design feature of 1940's and 1950's chronographs), but formed an outer ring around the five minutes markers. The dial immediately looked bigger and cleaner. 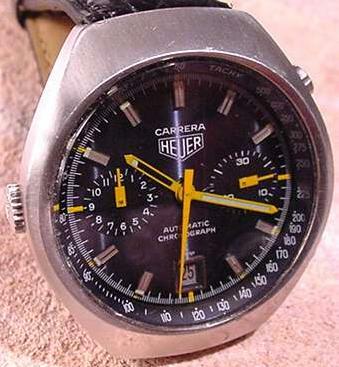 It's fair to say that Heuer was already moving in this direction prior to the first formal naming of a Carrera model. The line was in continuous production until the late 1970's/early 1980's in one form, model, style or another. Design changed with the taste of the times from classical-elegant, round case, small lugs (until mid 1960's) to, well 1970's style - large and fancy cushion cases. 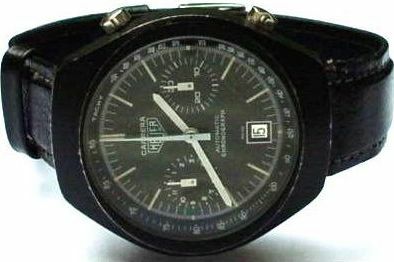 The last vintage Carreras in the 1980's showed more modern designs like the contemporary Lemania, Omega or Porsche Design watches. 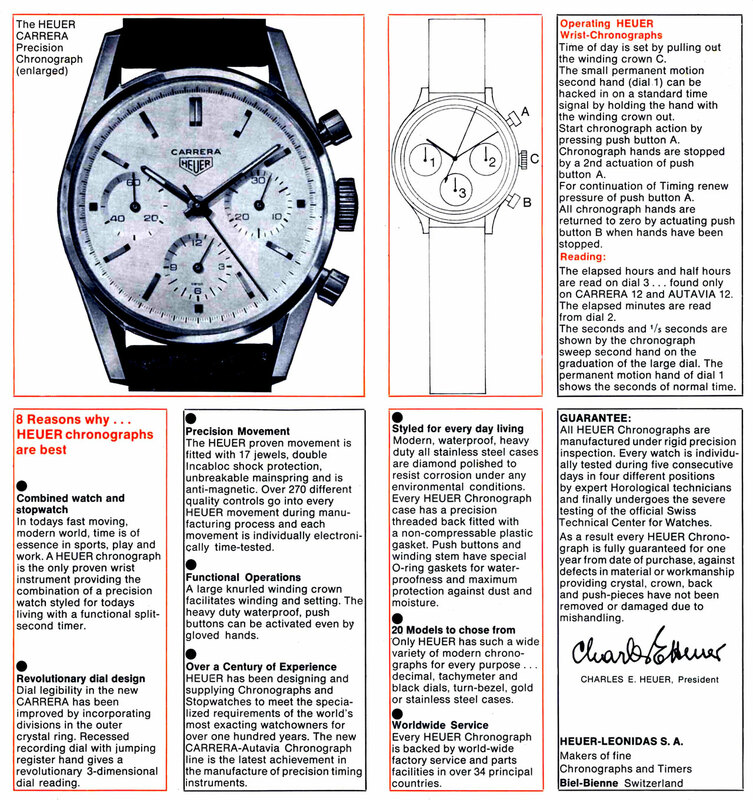 This article is an attempt to show the origins, the growth, the seeming death and rebirth of this classic "tool-watch" chronograph. 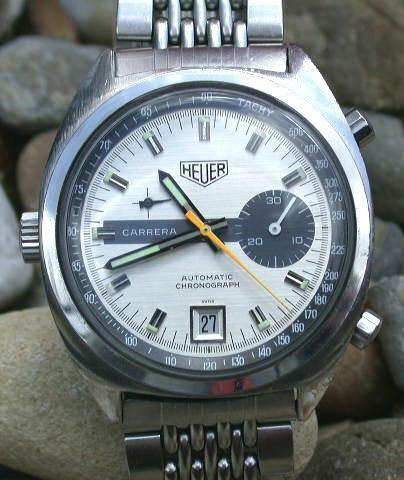 The Heuer Carrera chronograph is sometimes overshadowed by it's contemporaries, but it deserves recognition and respect from the watch community. 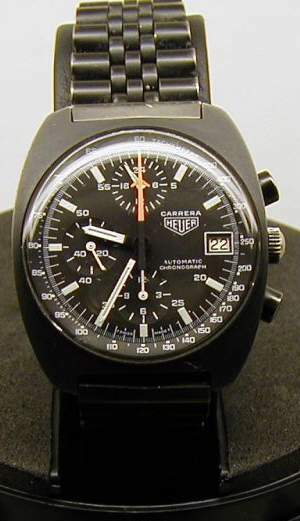 -- An uncommon Carrera 12 Black w/White Sub-dials. 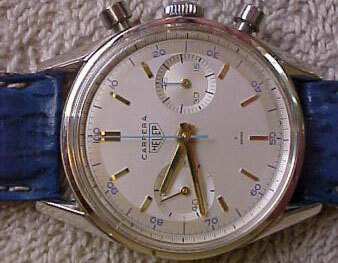 Heuer during this epoch often produced watches with little rhyme or reason. 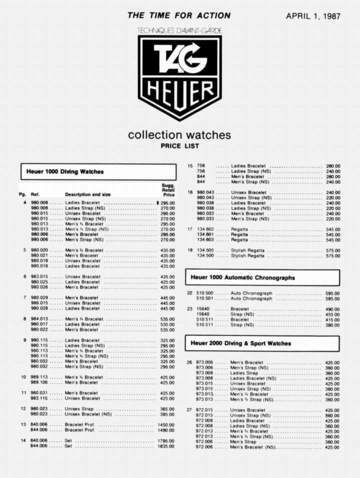 Actually, that's a bit incorrect, Heuer during most epochs often produced watches with little rhyme or reason, and the 1960's were certainly no exception. It seems that if they could produce a certain model and thought they could sell it, they did produce it. So one sees some particularly weird Carreras floating around... For they were, well, odd times. So often it is difficult to tell for certain if a certain hand is proper or not. After 1969, while Heuer continued to produce and market manual wind and even quartz models, the main thrust of their efforts were with the newly introduced automatic movement Cal. 11/12 and later the Cal 15 was used. 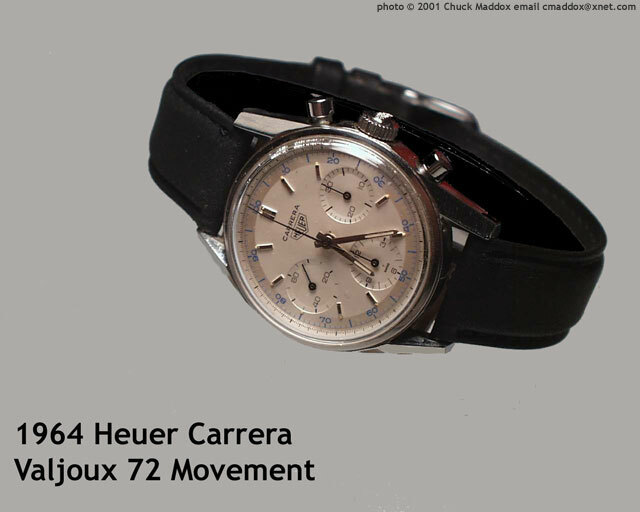 Well, truth is that Heuer didn't really move the crown. 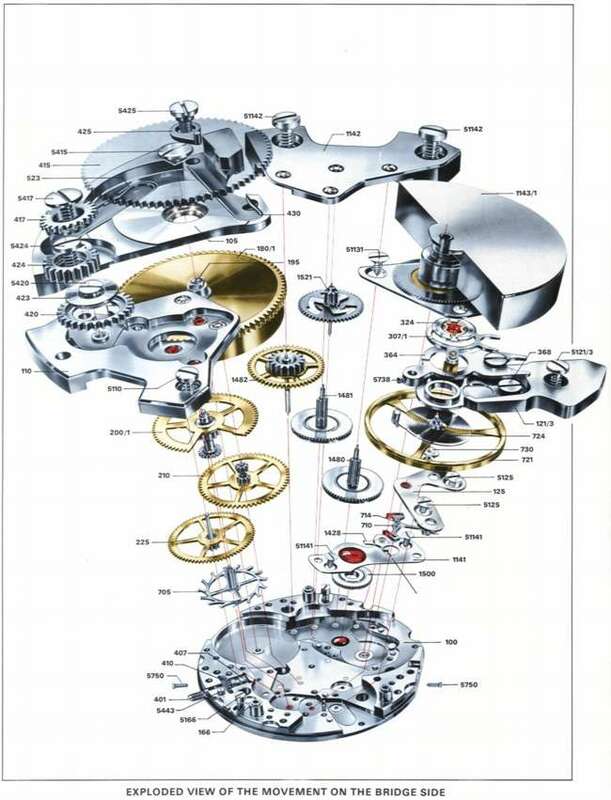 The Calibre 11 family was the first modular chronograph construction: a chronograph module made by Dubois-Depraz was attached to a Büren micro-rotor movement. 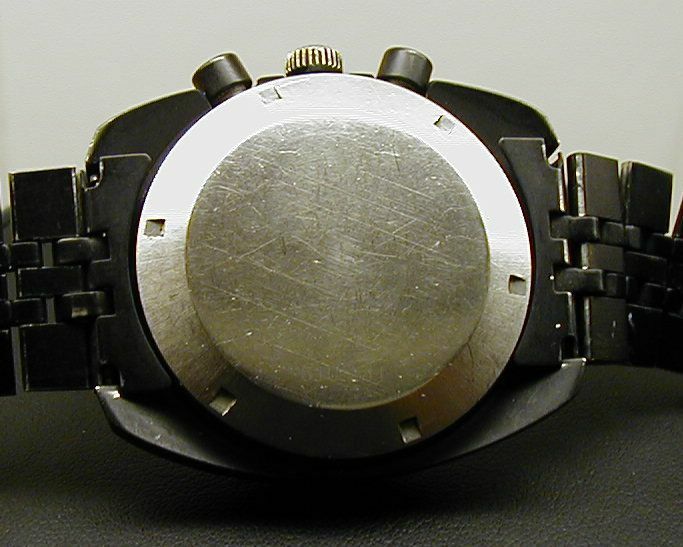 To fit, the chronograph plate had to be rotated by 180 degrees. So the strange placement of crown and pushers was a technical necessity and not a tribute to the self-winding feature. So it was a change made out of necessity, not choice. Special thanks to Jeff Stein for his contribution to this article. I feel it adds greatly! 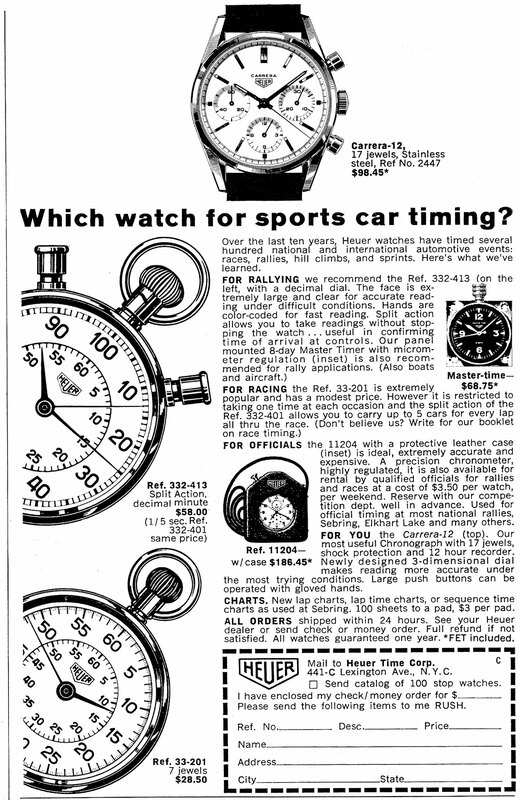 A search of information available on the race for the first automatic chronograph reveals several very useful articles available on the Internet. So we will not repeat those efforts in this article. Three very good articles are: 1969, World First Automatic Chronograph by Boon (no email address provided), The Race for the First Auto-Chrono Movement by Ignacio, and Christoph Ozdoba's A Brief History of the Automatic Chronograph. The English language text begins on page 3 with a diagram for use with the Micro-Rotor movement on page 12. 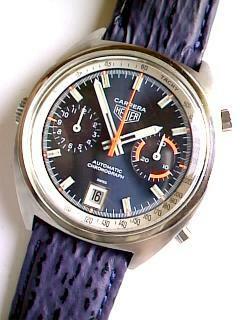 Perhaps the ugliest "Carrera" in captivity! with sweep second in place of 12 hour counter. 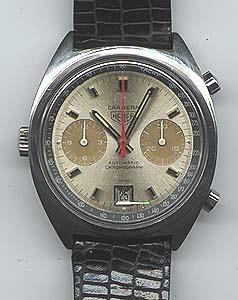 Perhaps this is one of the last "real" or "Old Heuer" watches. 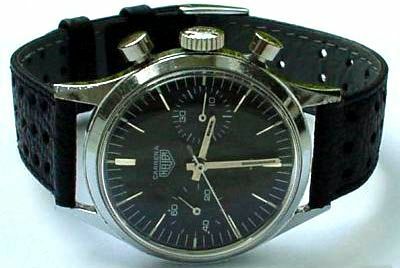 Like most European watch manufacturers Heuer was hit hard by twin blows of the quartz-boom and the "Japanese watch invasion". In 1984 the company was sold to Akram Ojjeh TAG-Group. 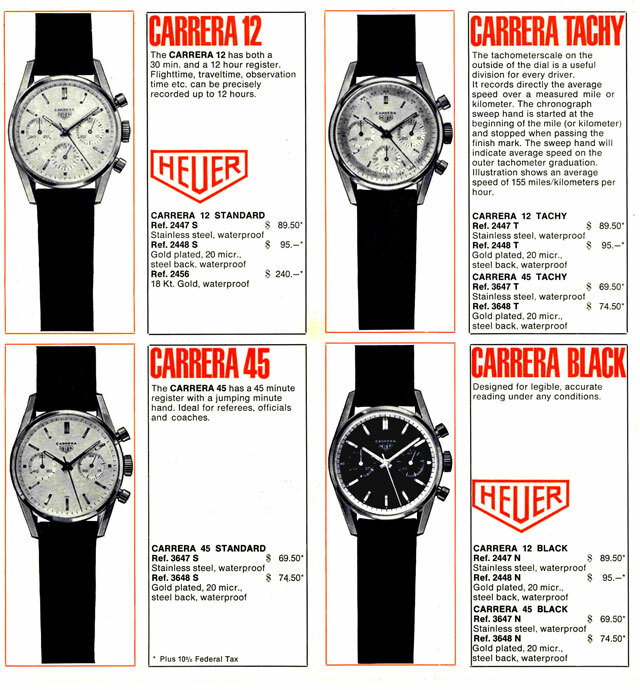 The brand name changed to TAG-Heuer and nearly all the old model names were replaced by numbers. 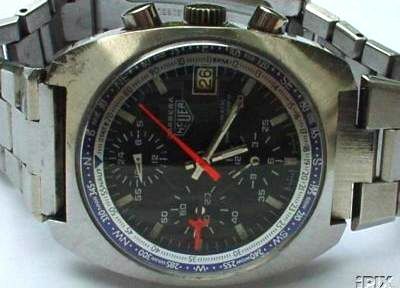 TAG-Heuer continued to sell the old models with Heuer markings until stock ran out of those dials. 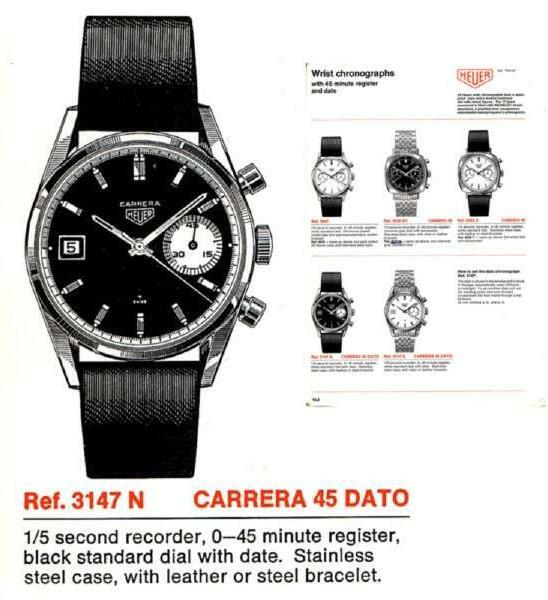 When they still had ebauches and other components they would sell newly produced "TAG-Heuer" models with the new logo in place of the old "Heuer" logo on the dial. 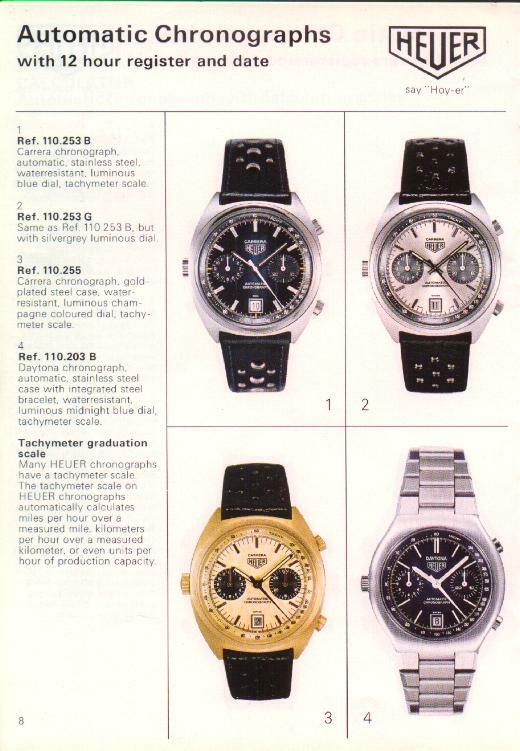 Some notable examples are the 510.5 series of "Pasadena" cased Lemania 5100 Chronographs, and the Pilot's Chronographs. The latter remained in the product line largely unchanged through at least 1995 when a switch was made in it's quartz movement. Once these components were depleted to a certain level these models were discontinued for the most part. 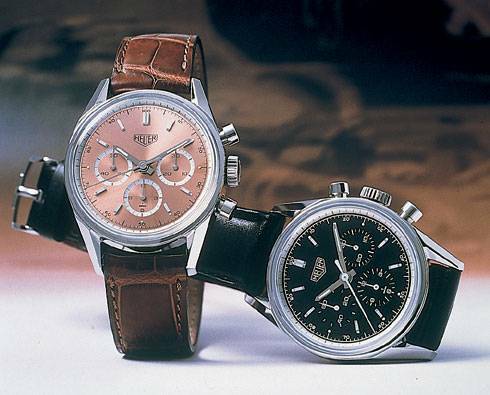 At this time Heuer produced at least two distinct versions of the 5100 Carrera, the 510.523 Stainless Steel version as shown at right. The story could well have ended then and there. 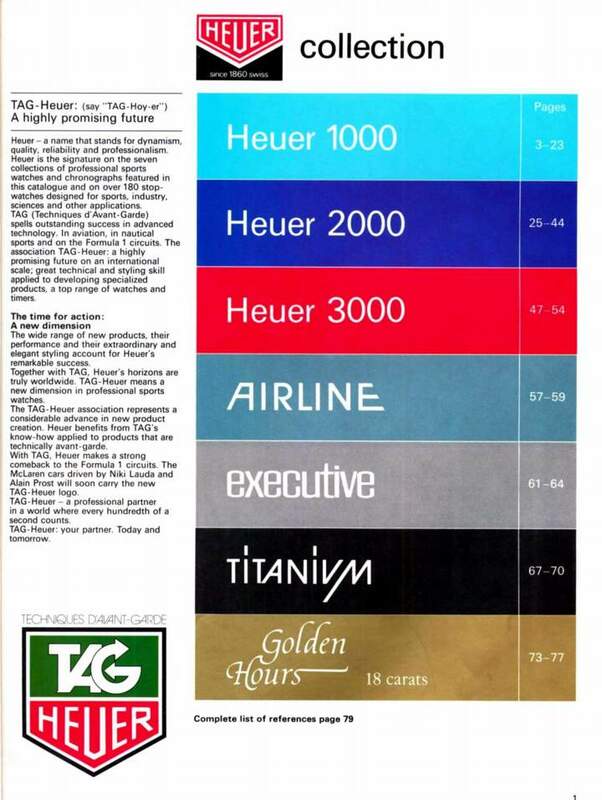 Under new management, Heuer was recast as TAG-Heuer. Old lines were dropped, new ones created. 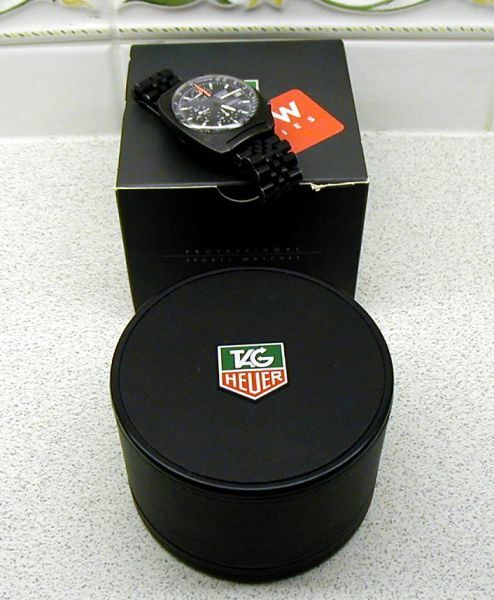 TAG-Heuer transitioned from a largely "Tool-Watch" manufacturer specializing in Chronographs, Stopwatches and sporting events timing, to a luxury watch manufacturer with an emphasis on "avanté garde" design. Hence the name "Techniqués d'Avanté Garde". While the new product line achieved great financial success, it came with a cost. 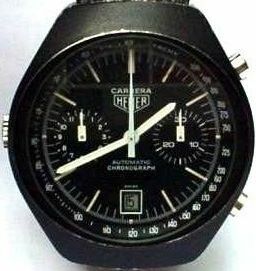 Many people who remembered and valued "the old Heuer" were not so keen on the direction that the new management were set on. For many years there was not a Carrera model, as the often plain, austere and older styling did not mesh well with the bold styling of the lines added after the TAG takeover like the S/EL and 6000. 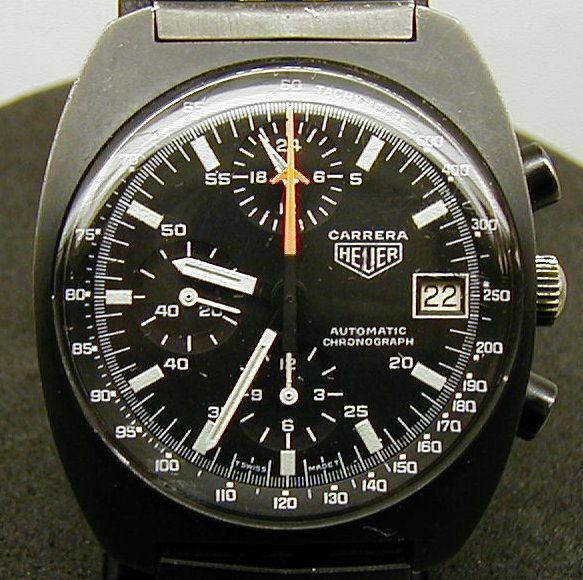 The Carrera line was largely forgotten except by those who had owned one, or perhaps wished they could find one to purchase. 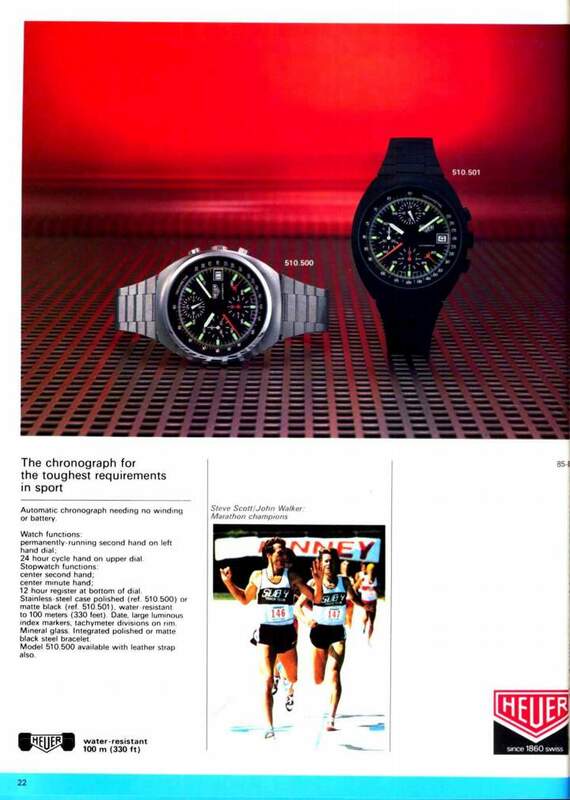 Eventually, towards 1997/1998, TAG-Heuer finally realized that the roots of the brand was still cherished and had retained great salability and launched a "Classics" series of watches. The first "new-old" model was the 1964 Carrera Re-Edition. 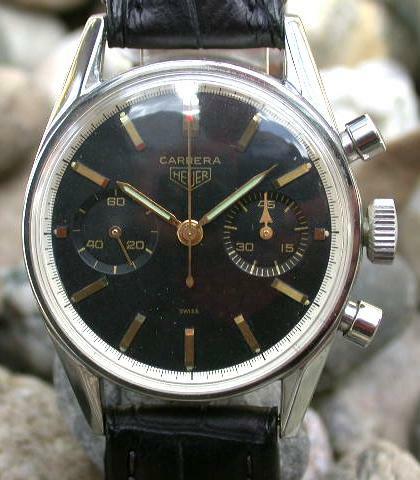 For the most part the Re-Edition models are a fairly close approximation of the 1964 Heuer Carrera as shown in the catalog near the beginning of this article. 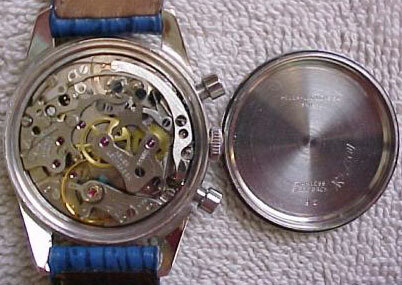 Internally, the original models were powered by a Valjoux c.72 movement. A venerable and very popular column-wheel mechanical movement used by nearly every major watch manufacturer at one time or another including Rolex, with the only exception seeming to be Omega and Tissot. 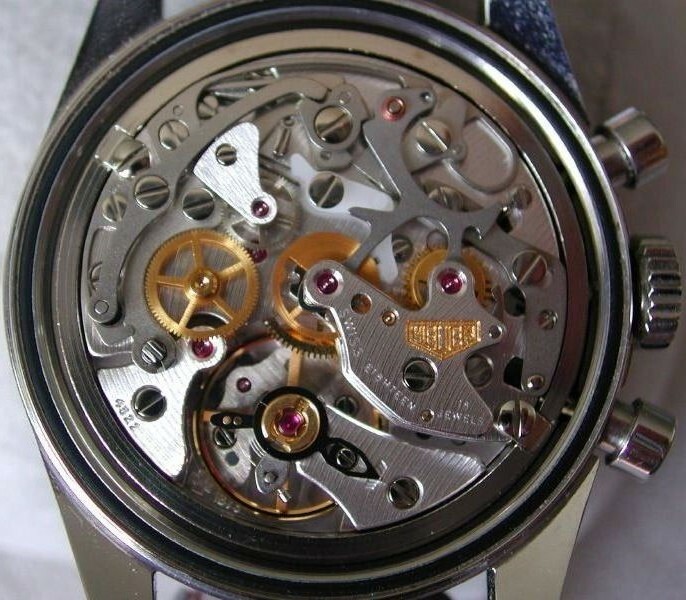 The Valjoux 72 was the counterpart and main competitor/rival of the Lemaina movement used in the Speedmasters of the same epoch known to most Omega owners/collectors as the c.321 movement. Valjoux ceased production of the c.72 movement at some point in the 1970's to concentrate on production of the 7750 family of movements which it considered to be the next big then. They seem to have been proven correct on that one. 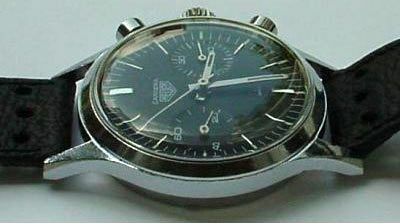 So when TAG-Heuer sought to re-release a version of the 1964 model, they ironically choose the movement that replaced the original movement's main competitor, the Lemania c.1873, known to most Omega fans as the c.1861 movement which power the current Omega Speedmaster Professional Moonwatch. The level of finish on the movements of the Re-Edition Carrera and the Moonwatch are comparable, nearly identical. 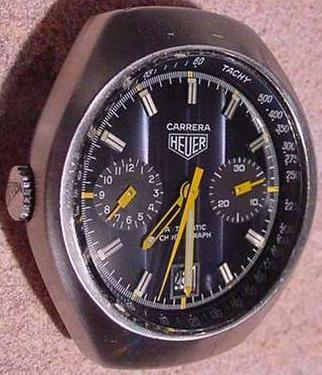 So once again anyone could visit their local TAG-Heuer Dealer and purchase a "Heuer Carrera" to wear while driving a vintage car through Mexico... The Carrera Panamercana rallye is once again alive since it's revival in the late 1980's. 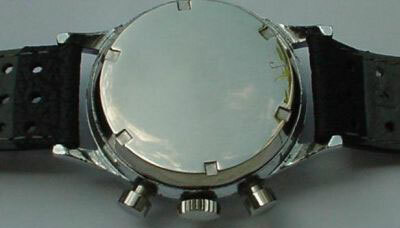 These models are identical to the previous Stainless Steel cased models with the exception of the dial and model number. The movement remains the Lemania 1873 used previously. These new models are "Classics" in name and styling only. 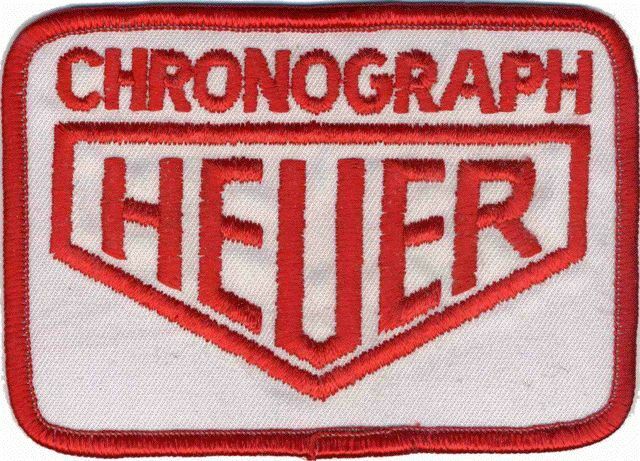 There are no direct or indirect relation to any models that Heuer produced in the 1960's or 1970's... At the time Heuer concentrated entirely on Chronographs, stopwatches and sporting event timing. 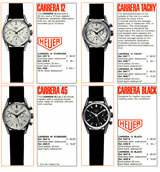 These new models sported fairly commonplace ETA movements in Carrera cases with newly designed dials for the Classics line. 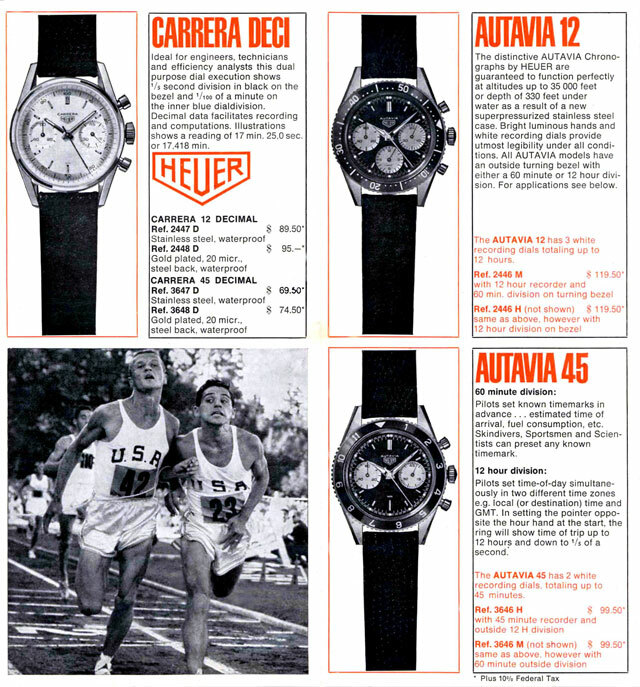 TAG-Heuer is at an interesting crossroad's... The near monopoly which Swatch Group holds on the production of watch movements, with Swatch owning not only ETA and Valjoux, but the recent addition of Lemania to their juggernaut has had ripples across the entire industry... Shortly before the turn of the millennium the luxury goods manufacturer Louis Vitton Moet Hennesy purchased TAG-Heuer which had been briefly traded publicly on the stock market. 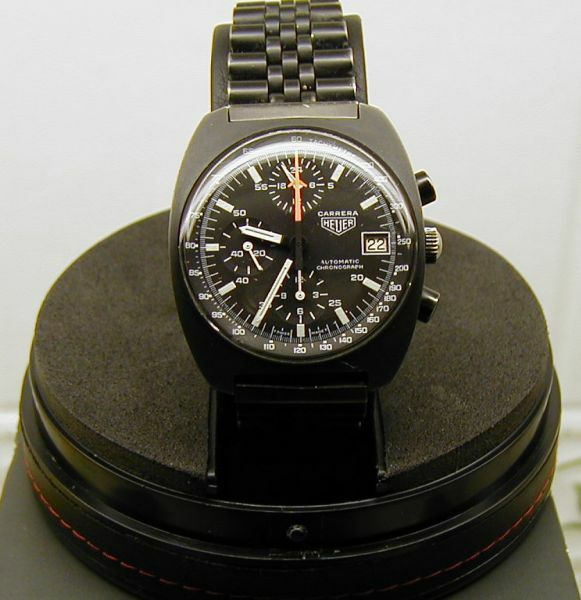 With the bulk of Lemania's production going to Omega for use in it's Speedmaster Moonwatch line it was often very difficult for TAG-Heuer to secure the necessary movements to meet demand on the Carrera Re-Editon models, although they remain in the lineup. Other Classics line models, the Monaco and the newly added Monza models sported ETA movements with Dubois-Depraz chronograph modules. The difficulty of obtaining Lemania movements, caused LVMH to purchase the Zenith Watch company as the Millenniums changed to secure the capability to produce their own movements. The latest announced model of the Monza sports a Zenith manufactured movement based largely on the famous "El-Primero" movement that was a competitor in the virtual dead heat race to produce the first automatic Chronograph movement. 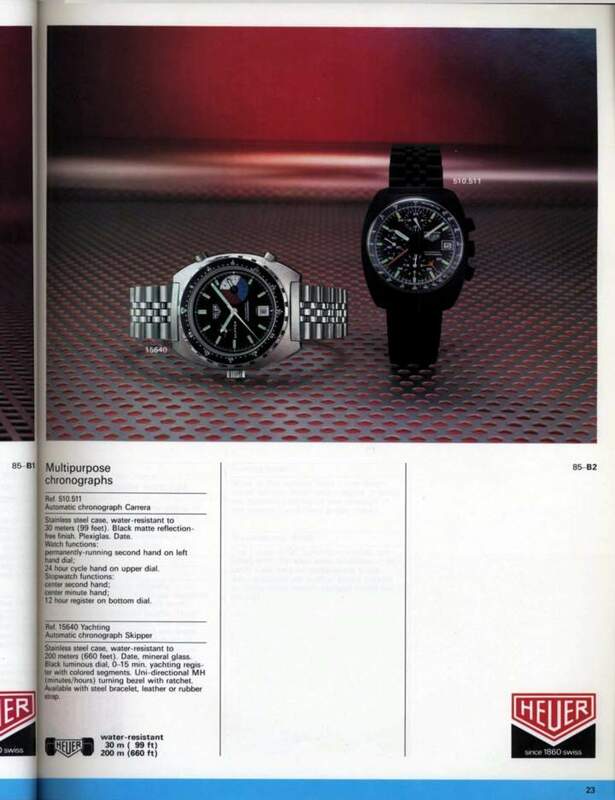 It's a bit ironic that while it can be argued that the Breitling, Hamilton-Bruen, Heuer consortium was the first to cross the line and that both the Zenith and Seiko camps have their advocates as well, that it's quite possible, even likely, that soon we'll see a Heuer Carrera sporting a movement based on it's arch-rival, once again. Where this saga ends is hard to say. 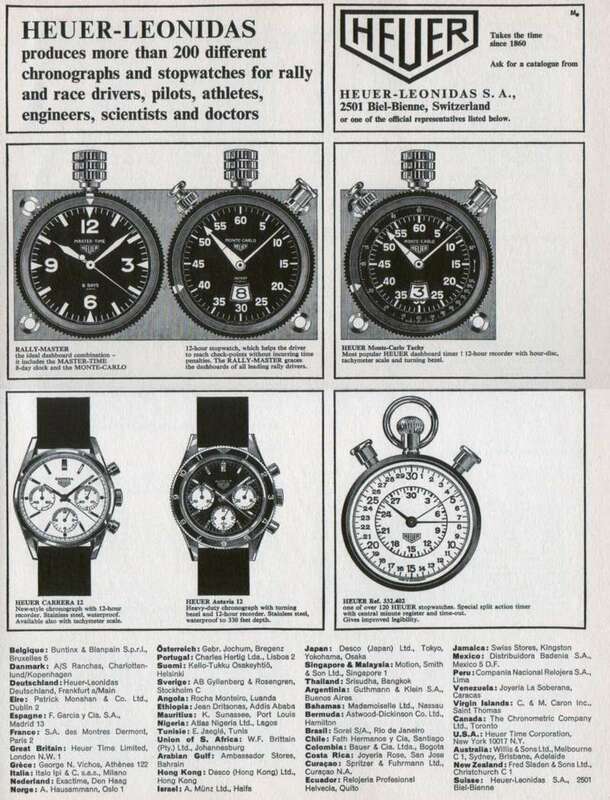 TAG-Heuer is a very successful company. 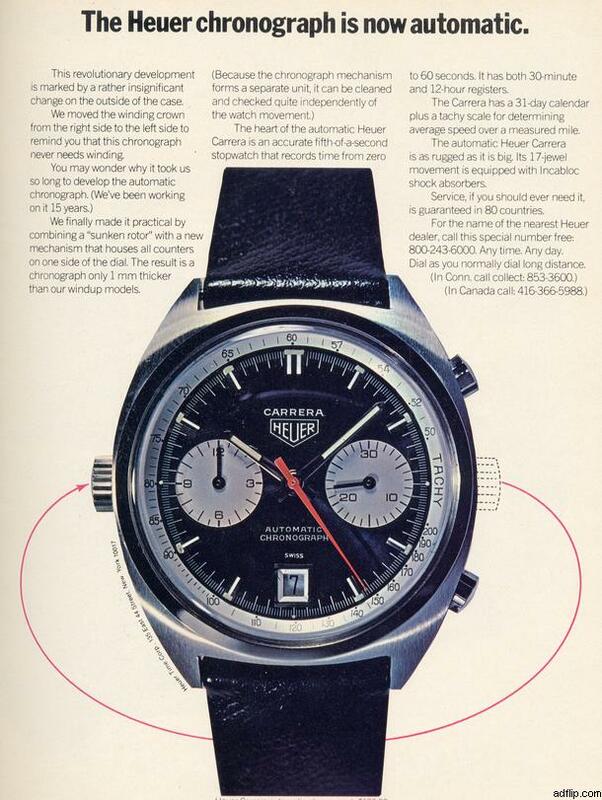 In many ways, namely profitability, more successful than it ever was prior to TAG-Heuer years. It has a good reputation amongst first-time buyers in the luxury Swiss watch market. In fact if you ask many first time buyers they consider their TAG's to be every bit the watch that Rolex is, but not as staid in it's designs. 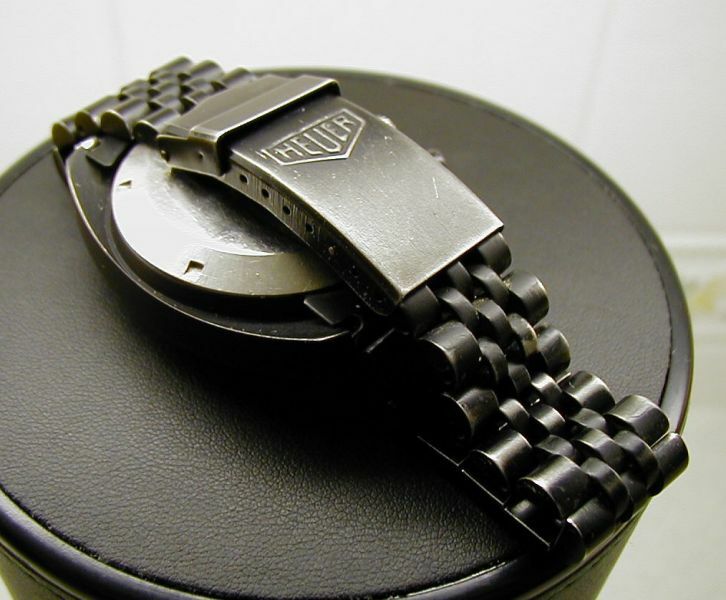 But in the hearts and minds of many in the watch industry and hobby, TAG-Heuer has strayed so far from it's roots that many people who have been interested in watches for sometime never even consider the Classic models. 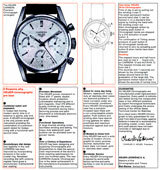 Many feel that it would be a good strategy for TAG-Heuer to center it's sales strategy on two product lines... 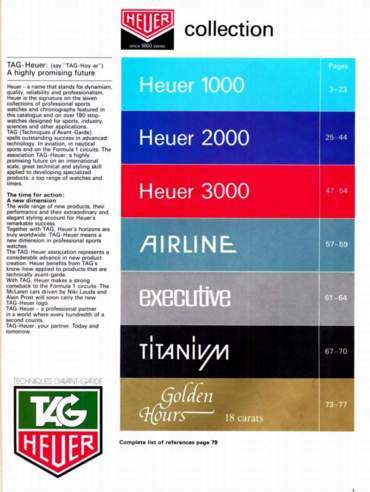 The TAG-Heuer line which would consist of the bulk of the existing product lines: 2000, 6000, Link, Alter Ego, Kirium, and Specialist lines, and a revived "Heuer" line which would consist of the existing Classics line with Heuer dials/crowns/clasps/etc. and new "homage" models, perhaps based around Zenith movements. 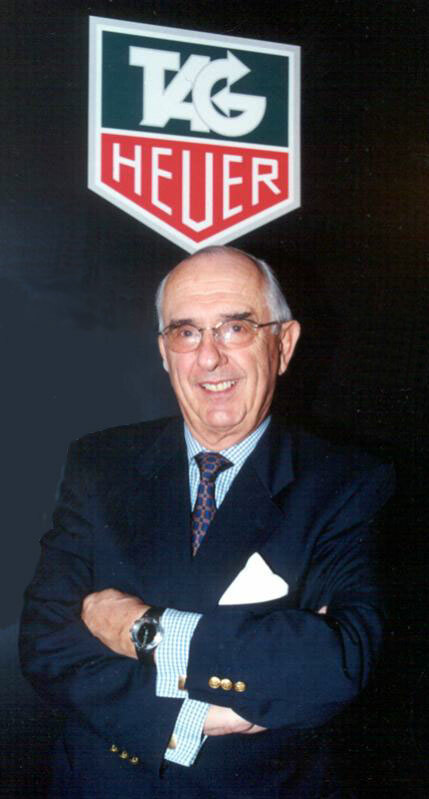 One piece of recent news that serves as a beacon for potential hope in this regard is that TAG-Heuer has recently secured the services of Jack Heuer, the driving force behind the original Carrera all those years ago. It is the hope of many that Mr. Heuer will forge a revival of the aspects of no-nonsense design that he championed previously. 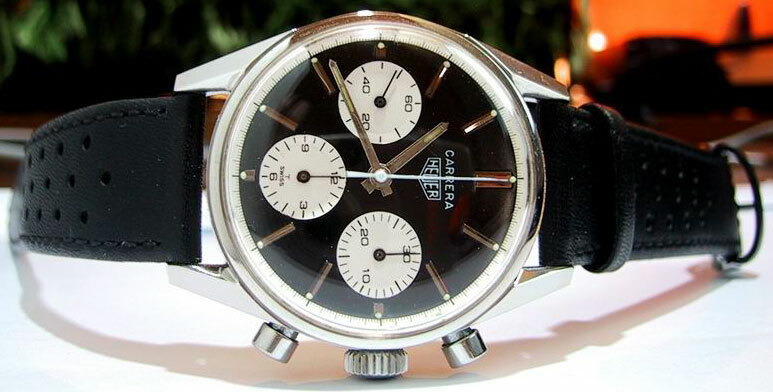 In many ways, the story of the Heuer Carrera is about coming full circle. 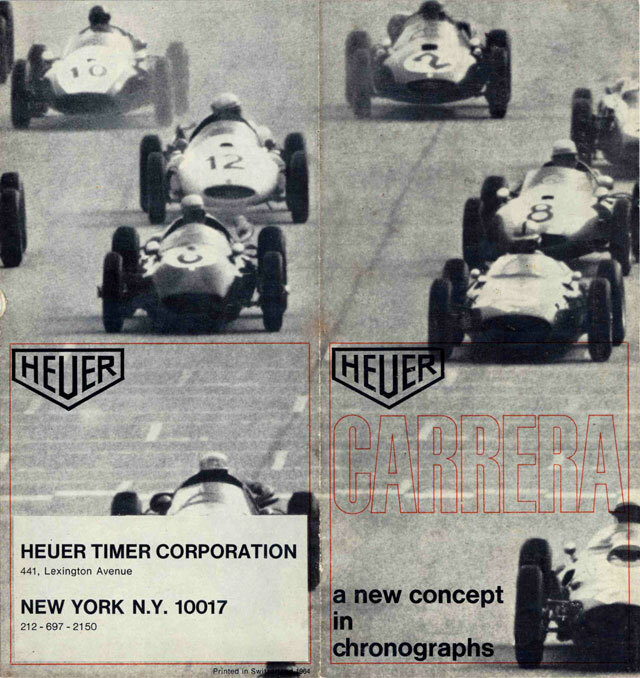 Like the great Mexican road race that served as it's inspiration, the Heuer Carrera has been about inspiration, growth, decline, memory, rebirth and growth. Coming full circle to embrace and incorporate aspects of it's competitors and rivals. 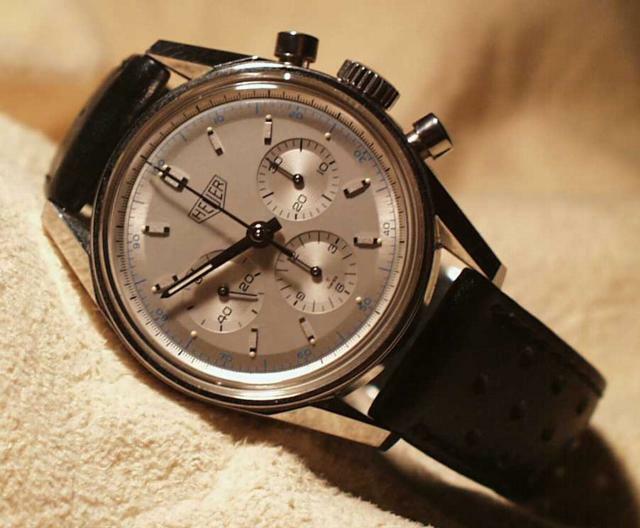 The potential for TAG-Heuer to move to a new tableau is there, the pieces and components are there, the finances are good, once the current economic uncertainty is overcome their positioning is good, and they have the man who started it all is back in the fold. Let's hope they move wisely with an eye not only on the short-term but towards the horizon as well. Caliber 17 (not the Zenith - that's a Caliber 36), MSRP is 2,150 Euros. As you can tell by looking at the other various models we have presented in this article these are unique watches to the Carrera history. 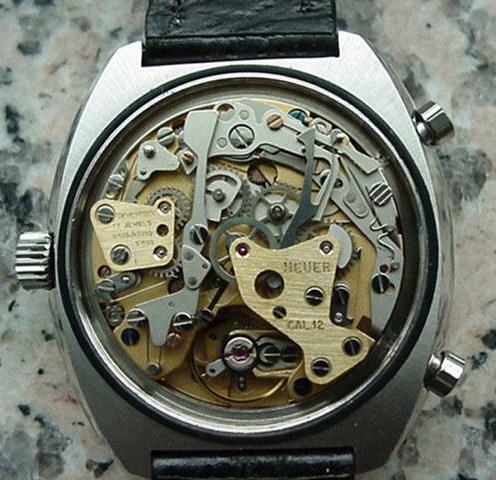 As pointed out by Jorge in his post, the movement is not a Zenith El-Primero based movement, but rather (because of the arrangement of the sub-dials a ETA2890-A2 with a DuBois-Depraz piggyback Chronograph movement module. 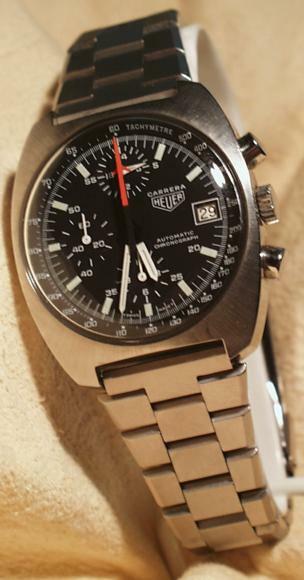 It's interesting that TAG-Heuer is calling this movement the Caliber 17, perhaps a tip of the hat to the earlier c.11-15 movements that also had Dubois-Depraz inspiration... Chuck discusses the ETA-DD piggyback movement in his article on the Omega Speedmaster Reduced which you may read by clicking on the supplied link. 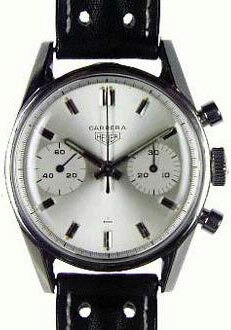 It's a shame that TAG-Heuer didn't incorporate a Zenith based movement in this Carrera, for it would be a world beater. The ETA/D-D movement is significantly less desirable. 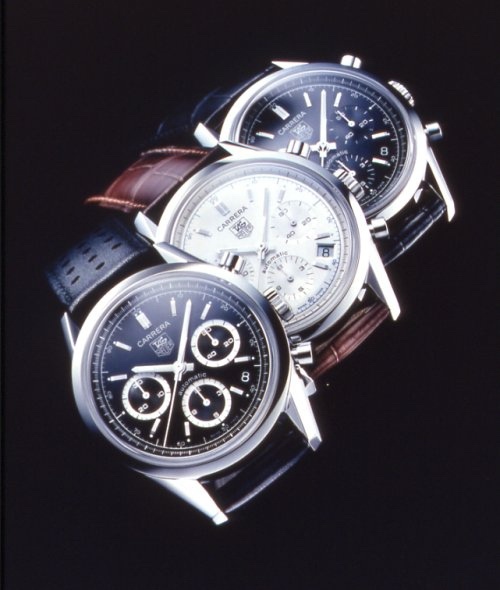 But hopefully Zenith will be able to increase production and we may yet see some Zenith-Carreras. 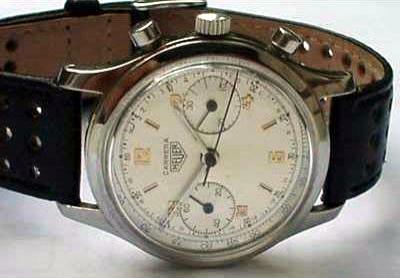 One of the more difficult things to do with vintage Heuer Chronographs is authentication of a watch. 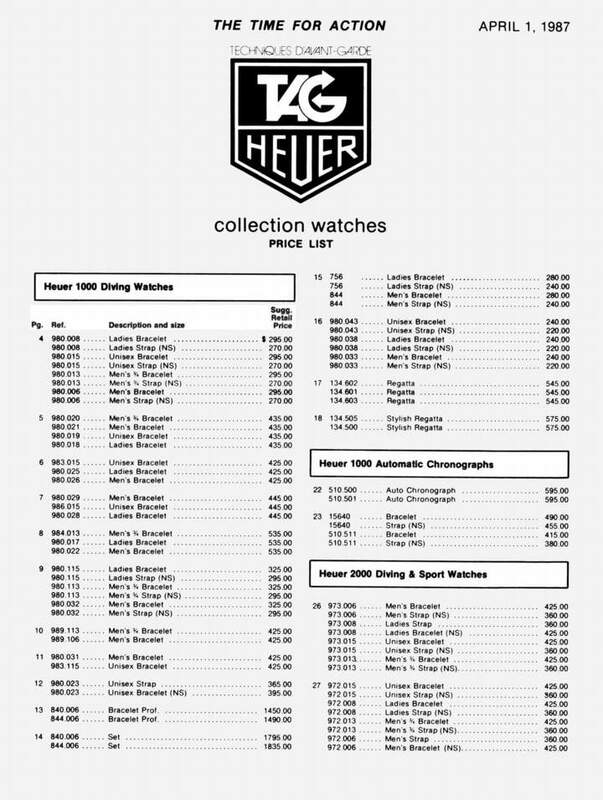 Since Heuer produced watches with many variations of dials, hands, etc. 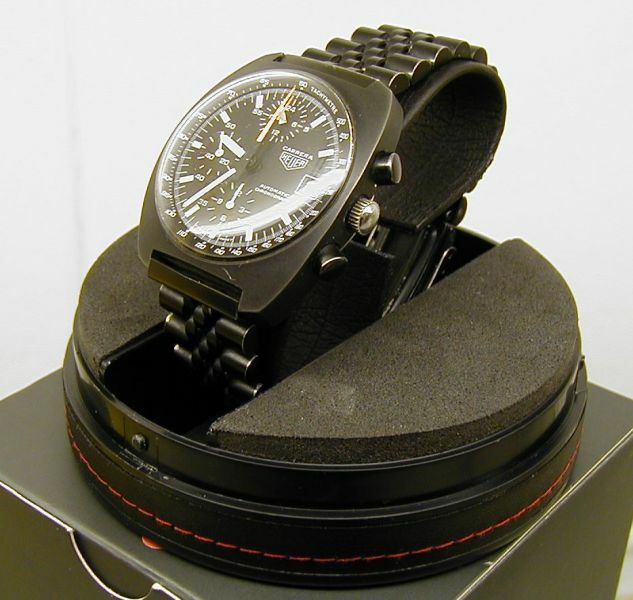 it is often difficult or nearly impossible to be certain that certain aspects of a given watch are correct. Aside from it's rough condition, there are a couple of things wrong with this example. The main timekeeping hands are incorrect, the under Plexiglas crystal has been replaced with a totally useless non-rotatable Compass/Slide Rule outer bezel of unknown origin (could be Breitling, Citizen or Seiko, or gosh! I don't know... Pulsar maybe? It's very screwy). 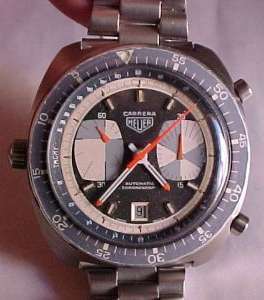 I'm uncertain about how restorable this example is, but if my (Chuck's) personal experience is any indication, my Heuer Carrera 5100 has been at Pro-Time (TAG-Heuer's national repair facility in New Jersey) since early May and it's nearly August for a crystal change and the addition of two links. So I would think restoration of this example would be a rather lengthy project. Buyer beware! This article is a collaboration between Matthias Liebe-Kleymann and Chuck Maddox based on a series of replies to a query for information on Heuer Carreras posted on the TimeZone Omega Forum on 19 June 2002 by Henrik E. Due to the timing of the posting, in the wee hours of the morning, and due to Matthias being located near Frankfurt he replied to the query first with textual information that compromises much of the copy in this article. By the time Chuck (who's located near Chicago in the USA) was aware of the post there were merely a few minor textual additions and a number of graphics. In the discussion which follows we decided to pool our resources for this article. Special thanks are due to Chris Wooley who also provided photos and or insight on the topic at hand... 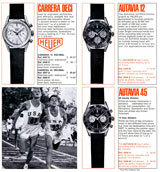 Without which the article would look and read significantly different, Richard Sexton who helped with back-checking some of the information presented in this article and David Alstott who lent Chuck a wide variety of materials during the winter of 2002-2003 that included the 1985 Heuer catalog which was reproduced for the 1980's section. Permission for personal, educational or non-commercial use is granted as long as this notice and the document remains intact and unaltered. The authors retain all other rights not specifically mentioned here... For all other use please contact the authors.